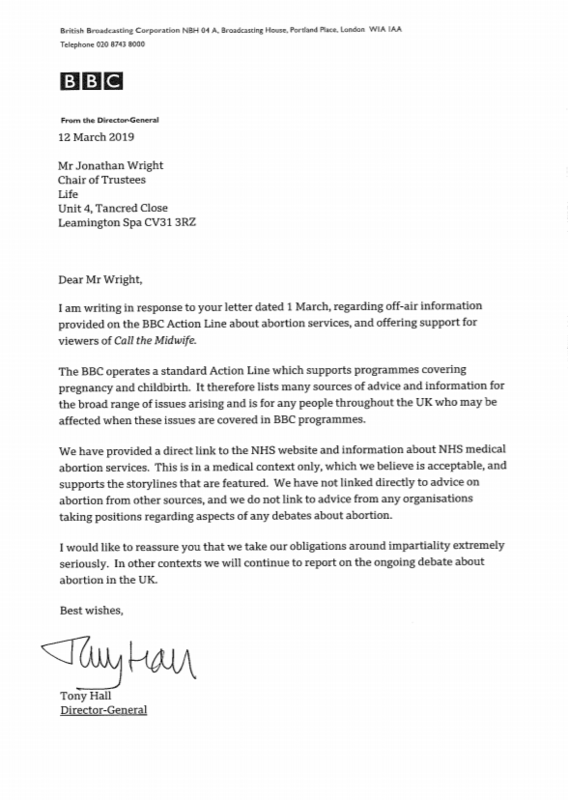 On March 1, Life wrote to the Director General of the BBC Lord Tony Hall asking that in the interest of impartiality, the BBC includes details of our Life Pregnancy Care service, Pregnancy Matters™ at the end of the “Call the Midwife” show. We noted that the BBC only provides on the programme at the minute, information about one option; terminating the pregnancy. Additionally we pointed out that as a charity which cares for thousands of vulnerable women every year, we believe that pregnant women should have as much information as possible to make informed choices. We pointed to the range of services provided by Life for almost five decades, aimed at empowering women with the ability to deal with some of the challenges which an unplanned pregnancy can bring. Lord Hall has now responded, declining our offer to advertise Pregnancy Matters™ support services for women in crisis. We are disappointed, although hardly surprised. Lord Hall argues in his letter below that the BBC links to the NHS. However, this fails to be impartial and is, in fact, precisely what abortion provider bpas was seeking, given bpas and Marie Stopes abortions are directly commissioned by the NHS. 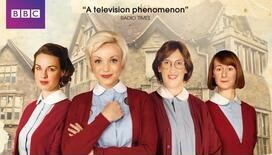 Under pressure from bpas, the BBC has caved in to the abortion lobby and has betrayed its own principle of impartiality. I helped out for many years at our local Life group that ran a hostel for 9 women and their babies. Not once did I witness pressure being exerted on any of the pregnant women just friendship and support. It was one of the most rewarding experiences that I have ever encountered. The only negative response came from a very militant women's movement that eventually saw the house close. Wow. Thank you for sharing this with us Mary. We're so grateful for all the help that you offered and I'm so glad that it was such a rewarding experience. We couldn't agree more - our work to provide positive alternatives to abortion is transforming lives with the help of wonderful supporters like you!